Libreoffice is steadily nearing its 5.0.0 release moment. According to the release schedule, this is supposed to be unearthed somewhere early August. The source code for its first release candidate was made available a few days ago. Because major new releases always give me headaches when updating the build script, I decided to tackle this issue ahead of time so that I can do a release of the final product without delays. But it turned out that two iterations of the script were enough to build a package for libreoffice-5.0.0.rc1 without errors. The application starts and seems to work properly, but who am I to judge that… I use vim most of the time when I write texts. where you can find the packages (all the dictionaries but no language packs, just the “en_US” localization of the interface) as well as the build script and patches. Please share your feedback with me on this blog page if you decide to download the packages and give them a spin. Posted: 25 June, 2015 in Slackware, Software. It seems to work ok. I loaded a few .ppt. a spreadsheet, and some .doc files. Compatibility issues with .docx seem to be the same as before… decent but not perfect compatibility with placement of images inside text. button text absent on some buttons in dialog boxes. I didnt find any major changes to make this a 5.x release rather than a 4.x but i did not look for the change log. Thank you Eric! So far it’s behaving well, although in your screenshot there’s already one bug I also found: the focused button’s text is unreadable. Thanks Eric, so far its performing well; less the focused button issue, I have nothing to complain about. It actually seems faster. Preliminary testing indicates 5.0.0.rc1 to work OK for me too. Even my powerpoint-no-music problem is resolved! I do *not* see the focussed-button issue as reported by others. Is it possible that you continue supporting the version 4.4.x on Slackware-14.1 after releasing version 5.0 in the Slackware-current? 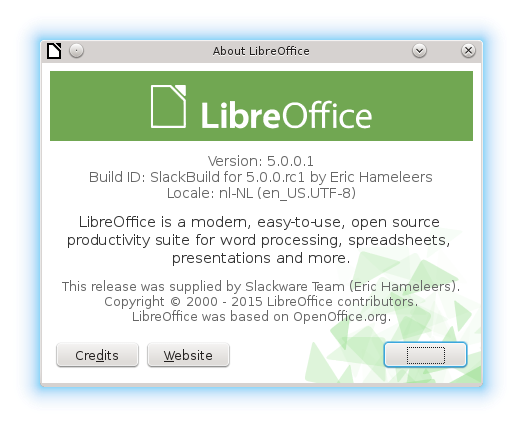 I will be releasing packages for LibreOffice 4.4.4 soon, that are meant for Slackware 14.1. For slackware-current, I will focus on Libreoffice 5.x.